Institute of Formal and Applied Linguistics (ÚFAL) at the Computer Science School, Faculty of Mathematics and Physics, Charles University, Czech Republic. The institute was established in 1990 as a continuation of the research and teaching activities carried out by the former Laboratory of Algebraic Linguistics since the early 60s at the Faculty of Philosophy and later at the Faculty of Mathematics and Physics, Charles University. The Institute is a primarily research department working on many topics in the area of Computational Linguistics, and on many research projects both nationally and internationally. 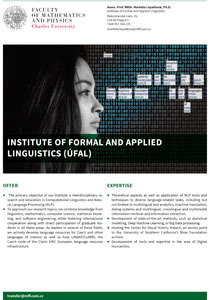 However, the Institute of Formal and Applied Linguistics is also a regular department in the sense that it carries a comprehensive teaching program both for the Master's degree (Mgr., or MSc.) as well as for a doctorate (Ph.D.) in Computational Linguistics. Both programs are taught in Czech and English. The Institute is also a member of the double-degree "Master's LCT programme" of the EU. Students also can take advantage of the Erasmus program for typically semester-long stays at partner Universities abroad. During 2000-2011, the Institute was the coordinator of the Center for Computational Linguistics. ÚFAL is located at Malostranské náměstí, in the building of the Computer Science School, Faculty of Mathematics and Physics (see the map here).